After preparing ourselves from our whole day activity, hubby decided to try some good restaurant at A.Venue for our dinner. I didn't expect that there are quite a number of good restaurant at A.Venue, because I don’t think a lot of people go there. Anyway, my husband chose Focaccia for our dinner; he already tried this restaurant together with his officemates last year that’s why he already has the idea on what to order. 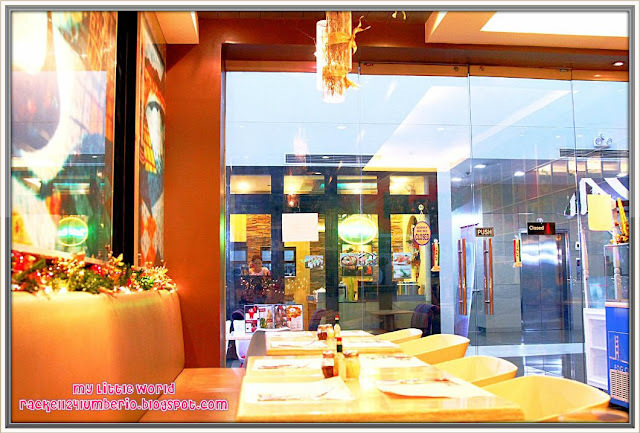 Focaccia is a unique, casual dining restaurant which serves more than 40 types of menu-selection and over 25 types of pizza creation. 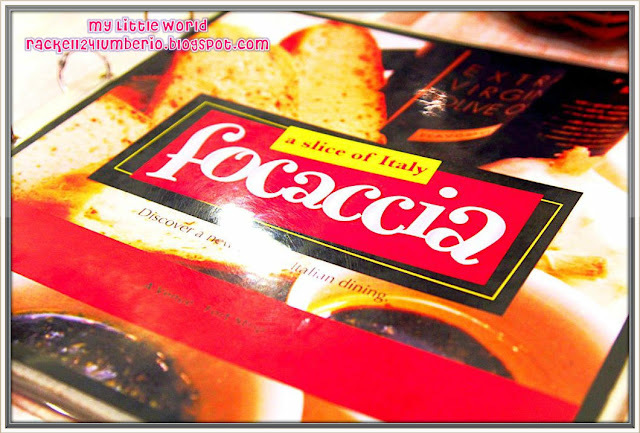 I read some reviews about Focaccia and I found out that their name was derived from the famous Italian bread which they bake fresh daily and serves complimentary starter for each of their guest. Wow! The place was so small; I think it can only accommodate approximately 20 persons. 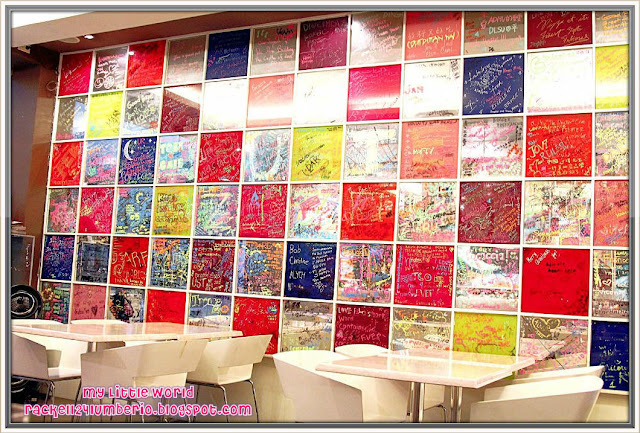 I like the bright and colorful glass wall with customer’s name and testimonials; it is quite interesting and entertaining. Oh by the way, I love their Christmas decorations too. 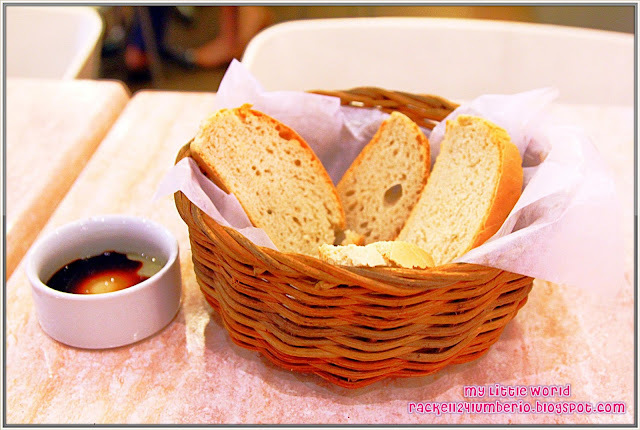 As soon as we were reached our table, we were given a complimentary basket of focaccia bread. Wow! It was definitely something to boast about. 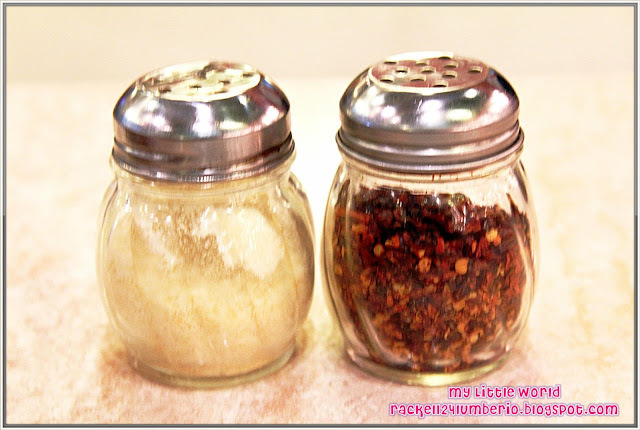 It’s a very nice idea to fill the customer’s stomach while waiting for their orders. I love their bread; it was soft and had a nice crunchy crust. It’s good to dip it with balsamic vinegar mixed with olive oil, if you want you can add some Parmesan cheese or chili flakes. I let my husband choose our orders; he wants me to try their best seller so he ordered Slice of Italy Pizza. The pizza is super thin crust pizza cut-up diagonally into strips, I guess 8 slices for the mini and more than 10 slices for the large one. 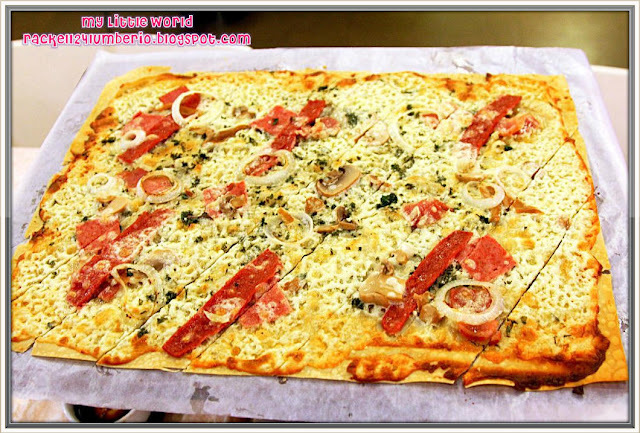 Slice of Italy (solo: Php 280; famiglia: 380) is a large pizza with ham, bacon, salami, caramelized onion, bottom mushroom, and cheese sauce cut into more than ten diagonal slices. It was served alfalfa sprouts and arugula leave to add a little bitter flavor to the pizza, unfortunately, it is not available. Booooo!!! 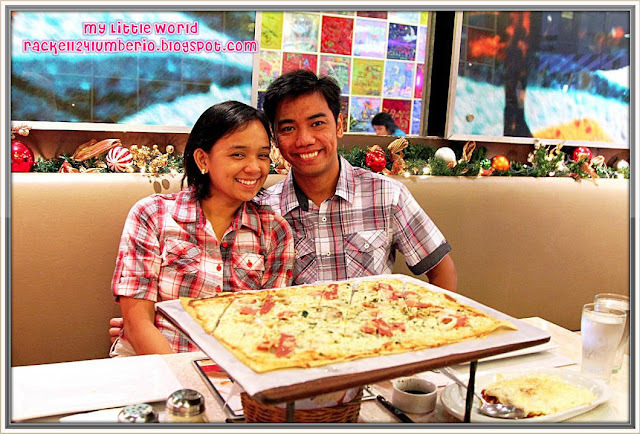 I’m so amazed when my husband told me how to eat this pizza. As they say here, you “Stuff, Roll and Enjoy”. Wow! This is the 1st time I heard this thing, ang galing! So all you have to do is to stuff your pizza with alfalfa sprouts and arugula leave then roll it up carefully. Hubby also ordered the Lasagna con Ragu for our pasta dish to go with our pizza. Actually, the taste of lasagna was just okay, it wasn’t anything special. 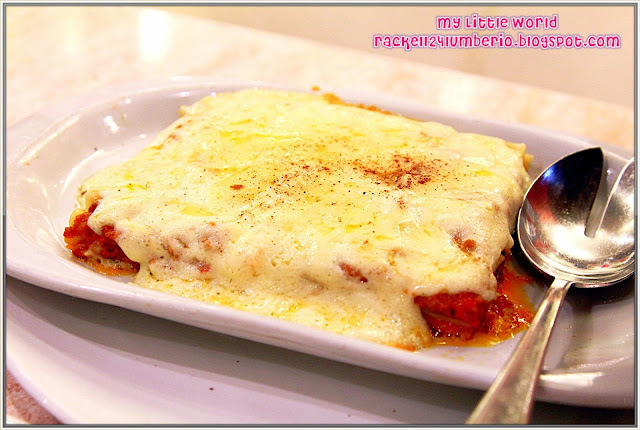 I was expecting that the serving will be huge, but I was a bit disappointed when we saw it, lasagna was too small. Well, I guess they just had a few layers approximately ¼ of the baking dish was served on. 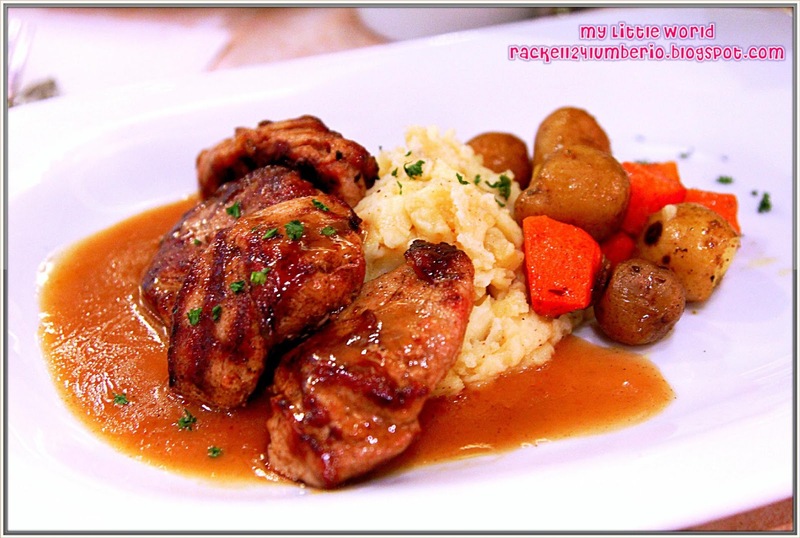 Hubby also ordered Pork Steak alla Marsala, with mashed potatoes, boiled carrots and steam potatoes. I love the mash potato and gravy, it so tasty. The pork are tender and juicy and guess what? hubby likes it. Overall, I enjoy our dinner and told myself I will go back here because the foods are delicious and the place is comfy and charming. 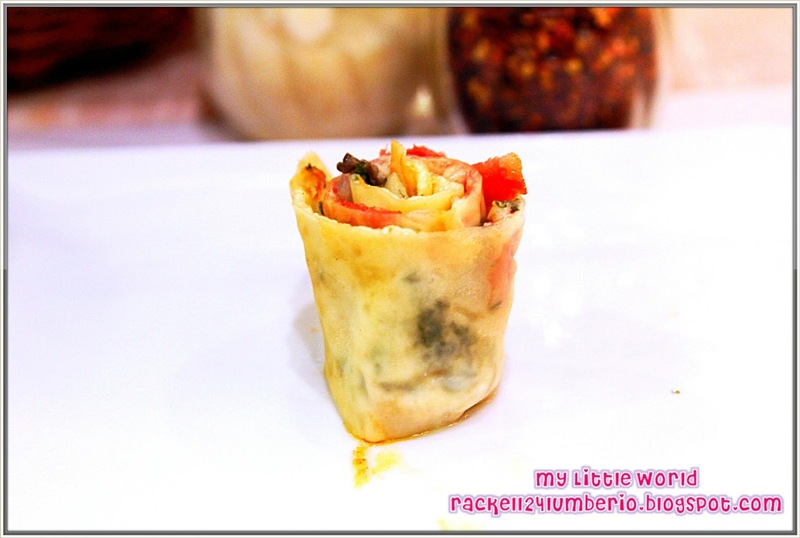 The rolled pizza looks great! And happy birthday! Happy birthday Sis :-) my family loves pasta and all the food looks delish :-) Dropping by from last week's Food Trip Friday.